Keeping your drivers updated helps ensure the best performance from all of your devices. Run a free scan now and check your system for driver updates. Hardware manufacturers are constantly updating their product drivers in order to fix problems or improve performance. 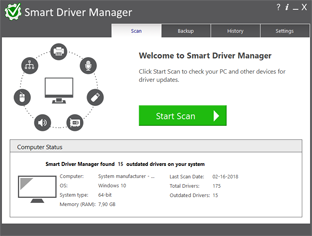 By running regular scans with Smart Driver Manager you can make sure you always have the latest driver updates installed. Some of the biggest problems faced by users upgrading to Windows 10 is when their existing hardware is not compatible with their new operating system. Smart Driver Manager can fix these issues by identifying the problem drivers and downloading the correct version for Windows 10. Smart Driver Manager has a database of over 1,200,000 drivers. We are constantly updating and editing the database to make sure that we have the best driver updates available. As a Smart Driver Manager user, you will have ongoing access to all database updates to ensure that you are always running the best drivers for your system. If you’re upgrading your operating system or just need to reinstall Windows, Smart Driver Manager can backup all the drivers on your PC or laptop. The driver backup will be compressed into a zip file that is easy to export and reinstall. In the end, Smart Driver Manager’s backup and reinstall features can save you hours of searching for and installing individual device drivers. Our goal is always to design simple easy to use solutions. With just one click Smart Driver Manager will analyze your PC and any attached hardware devices. The scan identifies outdated drivers and finds the correct new drivers to replace them with. With Smart Driver Manager even if you’re a novice computer user you will be able to easily find, replace, backup and restore your drivers. Built-in Scheduler means that you can set it and forget it! Simply set the built-in scheduler to run a scan automatically at start-up or at a convenient time either daily, weekly or monthly. Smart Driver Manager lets you know when new driver updates are available for your system so that you always have the best possible drivers. 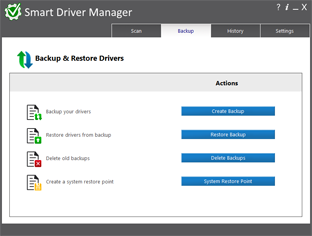 Smart Driver Manager offers a fast, easy and safe solution for automatically managing and updating your drivers. The program scans your computer and all associated hardware devices and provides a list of all the drivers that need to be updated. With just a single click Smart Driver Manager safely installs each update on your PC. Finally, the driver database contains over 1,200,000 drivers and is constantly updated ensuring that you always download the most current drivers.